BG Group is a British Multinational oil and gas company operating in 25 countries across Africa, Asia, Australasia, Europe, North America and South America. Soil Solutions latest project was located at one of its gas plants in the northern part of Bolivia. Soil Solutions was contacted by BG Bolivia to provide a method of runway stabilization and dust control for the La Vertiente runway. The existing problems included loose gravel, the loss of fine material, low visibility, dust conditions and a slippery surface when wet. Such conditions did not allow for the use of the runway during and after rainfalls, which significantly limited the Vertiente plant operations. As BG Group is committed to the continuous improvement of the safety of their employees (Value Based Safety Strategy) Soil Solutions was selected to improve the quality and safety of the runway. The Team at Vertiente followed the preparation instructions provided by Soil Solutions and had the runway graded and compacted with all loose material removed. Having correct preparation and two water tankers available the EBS Surface Seal application could be completed in 5 days. Soil Solutions oversaw the application that resulted in a hard, water resistant, corrosion proof, dust free surface that significantly enhanced safety standards. With this upgrade La Vertiente airstrip has highly visible FOD and increased skid resistance even in the wet conditions. 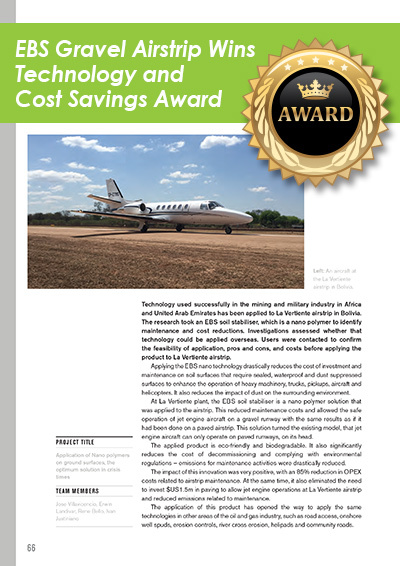 With the application of the EBS, BG Bolivia is significantly increasing the safety and reducing its annual airstrip maintenance and operational costs, as well as environmental impact. The original EBS Surface Seal was completed during May of 2015 and continues to provide for less required maintenance and the safe operation of jet engine aircraft.